Looking for a cost effective way to reach out to local markets? Sphinx Business Solutions and the US Postal Service make it easy with Every Door Direct Mail (EDDM), a simplified way to reach every house (and business) in a neighborhood. EDDM allows your business or organization to send large mailers for small dollars. It’s a special service that “bends the rules” to allow businesses, churches, and other organizations to mail oversized postcards or other mailpieces to every address in a postal service route. The cost is low, as little as $.183 cents for local area mailings. 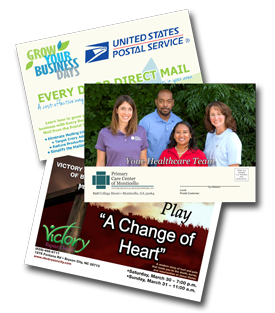 Conduct direct mail campaigns at low unit costs and high ROI. While large postcards are the most popular EDDM mailer, the USPS has built a lot of flexibility into the program. Mail sizes can range from 6.5” x 9” to 12” x 15” and can be as much as .75” thick with a maximum weight of 3.3 ounces. Square product samples, booklets, and folded postcards can all be mailed as an EDDM campaign. It’s actually not too difficult to figure out the system. The post office provides a straightforward ordering site for EDDM that includes mapping software to help target mailing routes and can generate paperwork and allow you to correctly bundle and submit mailings to local post offices. You can also pay the postage online. The retail version of EDDM was designed as a do it yourself (DIY) product, but there are a few complications. Do It Yourself Mailing - Sphinx can help you to design and produce your mailpiece and will deliver the quantity you order in bulk. You’ll be responsible for bundling the mailings according to USPS regulations, for paying the postage, and for delivering them to the designated local post office. This is a good option if you’re considering frequent small mailings to just one or two postal routes. 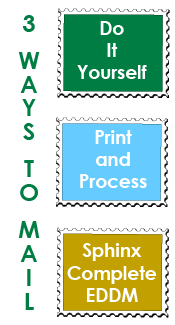 Print and Process – Sphinx helps with design, print, and packaging of your mailing for the postal service. Let us know the postal routes and we’ll provide the paperwork. We’ll bundle the mailpieces and deliver or ship the completed mailing to you. You’ll be responsible for getting the mailing to the correct post office location(s). Sphinx Complete Mailing – Most of our customers do it the easy way. Sphinx will help you with targeting and selecting the routes for your mailing. After your postcards are designed and printed, we’ll do all of the processing and deliver the mailing to the USPS. The additional charge for delivery to the USPS is only $35 in the Macon/Warner Robins area. Additional postage or shipping charges will apply for out of area mailings. Printed 2 sides in full color on 10 point coated stock. *Additional charges may apply for out of area mailings. **Total price per piece is for Sphinx Complete EDDM mailing. and I'd like a 10% discount on printing, too! 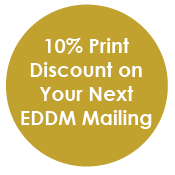 Fill out the short form below and download a coupon for a 10% discount on the print portion of your next EDDM mailing. We'll give you a call to answer any questions you might have about EDDM, mailing options, or design.